Baby on the train – whom to sensitize? While it is ok for D’s experiments to carry on at home with full freedom, what about outside where other people are not as tolerant? Do I need to restrict her when she is being a little bit too friendly for other people’s liking? Whom do I sensitize – my baby or the other passengers? The message I sense that you are getting from these passengers is, “Control your child, this is not a playground.” Your daughter is thinking, this is way better than a playground – it moves, and there are so many more people to play with! If you agree with her, find more people on the train who share her view and let them play to their hearts’ content. On an overnight journey, try to ensure that she gets enough play during the day so that she is ready for bed at night when passengers are sleeping. 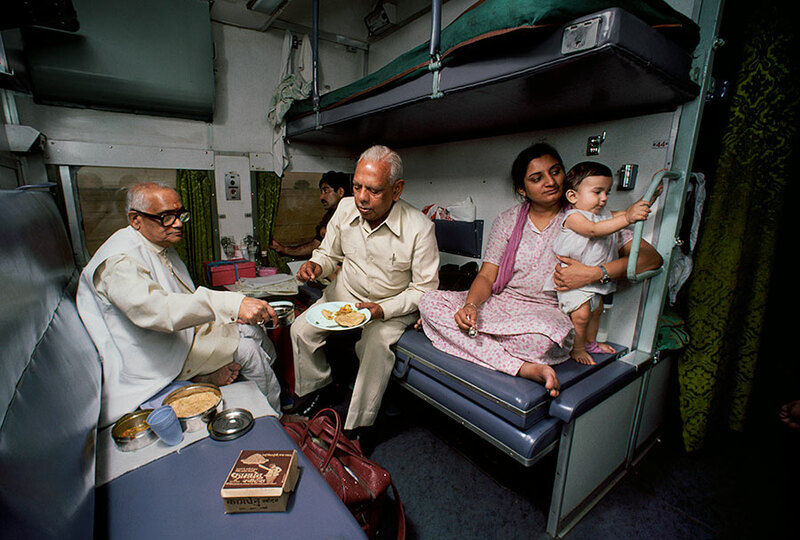 Babies enjoy the Indian Railways … especially the upper berth! If she keeps her volume to a reasonable level and does not touch other passengers or their belongings without their permission, then I don’t see that she needs to be reigned in. Our train journeys were full of nonstop chatter, wandering up and down the berths and compartments. We have also tied blankets up to serve as swings and slides. Meanwhile back in your own compartment, help your baby accommodate those who do not share her view, and vice-versa. It is not too early to bring up the golden rule, do unto others as you would have them do unto you. Talk to your baby cheerfully without any embarrassment, in a normal tone that the others can also hear. If she is climbing onto other passengers, taking their magazine out of their hand or playing with their shoes, you should intervene promptly. I would say something like, “We can play with my shoes, but not with their shoes. Those shoes may look different and intriguing, but we can only look at them. We cannot touch those shoes. We can count the shoes if you want or try to draw them on this paper.” This makes it clear to the other passenger that his or her shoes (or book, pen, phone, or tiffin dabba) are safe, acknowledges the baby’s interests, and offers alternate ways of pursuing them. You can also request that your co-passengers keep any particularly attractive items inside when not in use. If she is being loud, I would point out how close together everyone is in the compartment and perhaps make a game out of figuring out the appropriate volume. If people are sleeping or engaged in quiet reading, you can explain that as well and play a game that involves whispering. Once it is clear that you are in charge, your fellow passengers may even relax and play along. Previous What to teach one year old?